After writing a piece profiling a 10-inch record, my interest in the other 10-inchers in my collection grew. Those clunky relics of the early 1950’s are actually pretty neat. Especially when they come in crazy colors, like this album! This album was a debut on a couple of fronts. 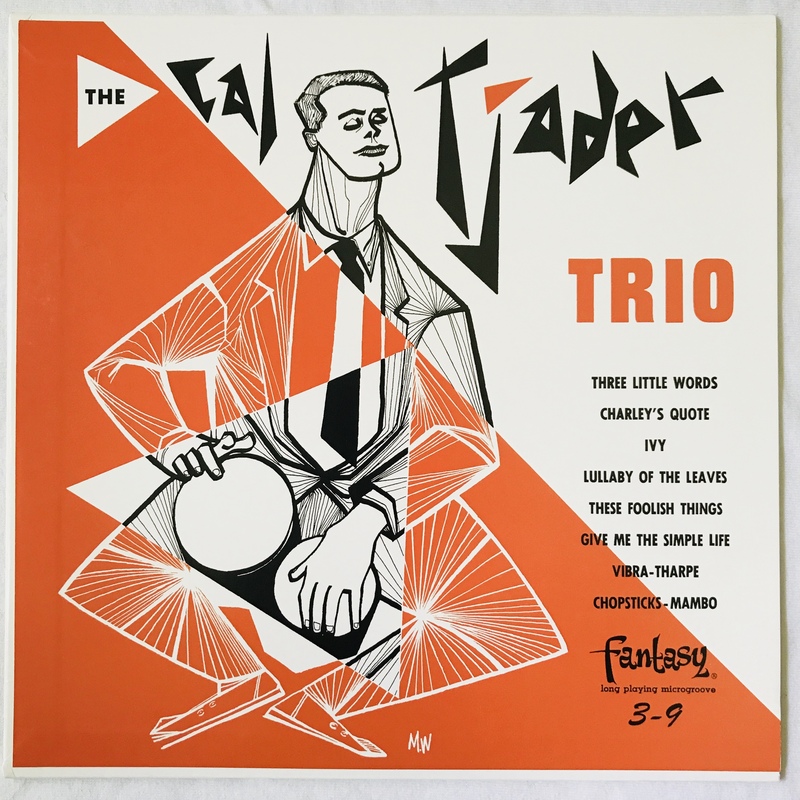 Firstly, it was Cal Tjader’s first album as a leader fronting his own group. Secondly, it was Vince Guaraldi’s first studio recording and his first appearance on record period. 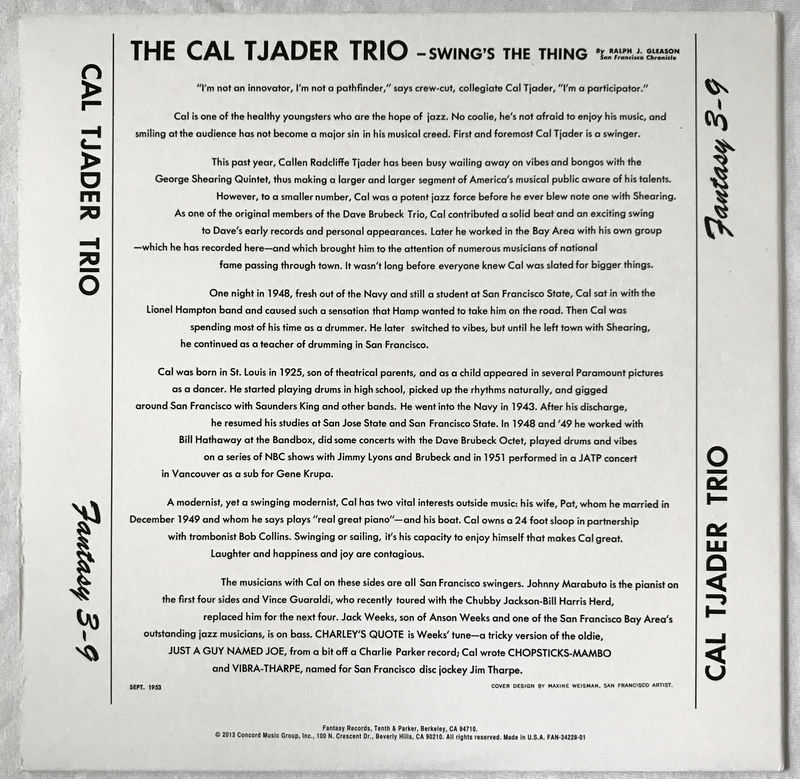 Before this album, Cal Tjader was part of Dave Brubeck’s popular trio, where he initially played drums before branching off to the vibes and bongos. 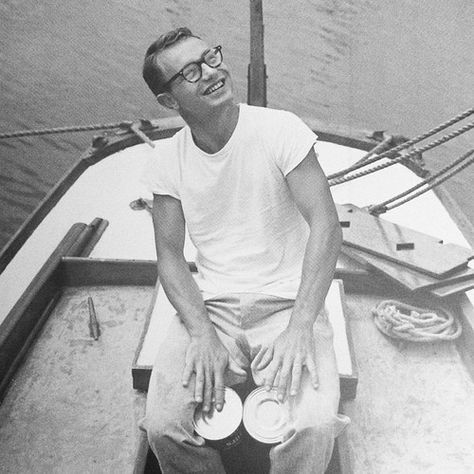 A near-fatal swimming accident in Hawaii in 1951 landed Brubeck in the hospital, leaving Tjader without work. 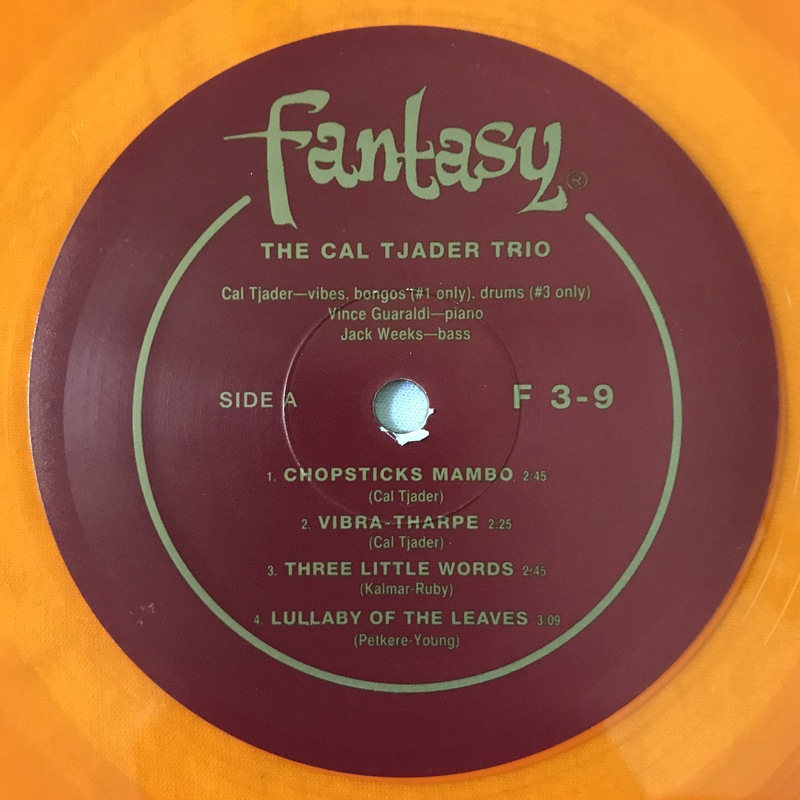 Tjader returned to California where the execs at Fantasy convinced him to form his own group and record, which resulted in this album. It was good move musically, as this album launched Tjader’s musical career. Meanwhile, Brubeck, in traction and without a band, formed a new group with his pal Paul Desmond. Of course, Brubeck went on to bigger and better things himself. Talk about making lemonade out of lemons. On Tjader’s first album as leader, he stuck closely to the formula that worked with Brubeck’s trio, including the same instrumentation. In fact, this is basically a more cool-headed (i.e. calm) Brubeck Trio, particularly the second half of the album. San Francisco native Johnny Marabuto is on piano, and while his playing is certainly tasty and enjoyable, it doesn’t particularly grab the listener. The first half, however, is full of fireworks, even ferocious at times, thanks to Vince Guaraldi’s vivacious piano. A seemingly banal tune Tjader wrote based off of an equally banal piano song becomes a roaring and interesting vehicle for Tjader’s crisp bongos and Guaraldi’s keyboard. Even in 1951, Tjader was smitten with the Afro-Cuban music that would make him famous later in the decade. 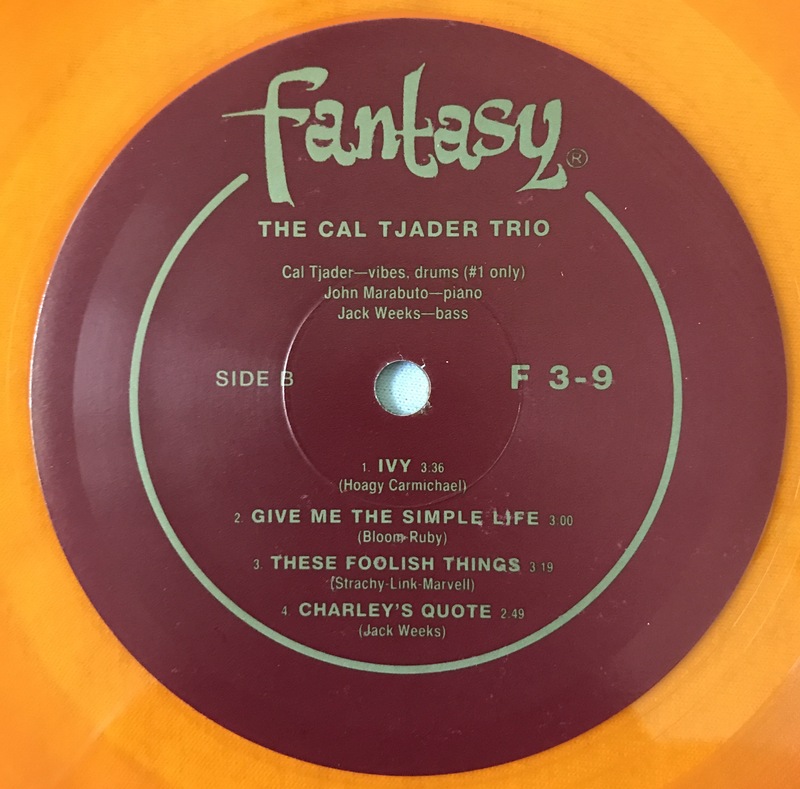 Another Tjader original follows, this time featuring both Tjader’s vibes and his lightning-quick dexterity as he makes the impressive leap from his vibes to the drums within about two bars. This was yet another feature he took from his time with Brubeck. The last tune profiled (I had to do three for this record. Each track showcases a different side of Tjader) is downright fiery and swings hard. Listening to Guaraldi’s roaring and confident performance, it’s easy to forget that this was his FIRST debut on records. The man sounds like a veteran! As with many musicians, he would mellow out somewhat as the years went on, and the Guaraldi we hear in the stores this time of year playing “Christmastime Is Here” doesn’t sound much like the wild, younger Guaraldi on this record. Admittedly, the fidelity isn’t that great on any of these tracks (particularly on “Three Little Words”), but the music was recorded in 1951, waaaay before high fidelity was standard. The music was recorded in the summer and fall of 1951, but only saw release as a series of 78-rpm discs in 1952 and then as a 10-inch album in 1953. The music wasn’t released on any other format until it was put on CD with another Tjader album over fifty years later. Allmusic was so thrilled with the album (surprise surprise), they didn’t care either. Giving it four and a half stars, they write that “… there’s a fresh exuberance to these recordings that renders that loss irrelevant.” Couldn’t have said it better myself. Quite simply, this is fantastic artwork. The use of shapes, specifically the triangle, is phenomenal-definitely mid-century, yet just as fresh in 2017 as it was in 1953. The colors (color, really) pop off the cover and grab the viewer’s attention immediately. Orange is an underused color choice for an album cover, and I’m not sure why. It’s used to fantastic effect here. Maxine Weisman is the creater, credited on the back as ‘San Francisco artist’. A quick Google search turned up nothing, unfortunately. I’d love to see more of her work. 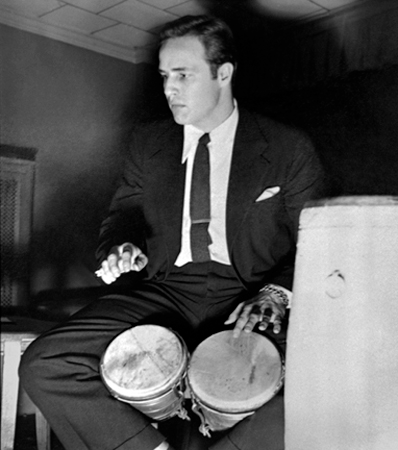 The picture of Tjader is pretty cool, although to me it looks more like another bongo-playing dude who’s star was also on the rise in the 1950’s- Marlon Brando. He definitely has a more than a passing resemblance to the picture on the album cover, no doubt because Tjader hadn’t begun to regularly wear his somewhat signature thick black hornrim glasses yet. Here’s Tjader looking like a proper Californian, with some makeshift bongos. Fantasy’s scholar-in-residence Ralph Gleason writes the liners, which spend most of the space extolling Tjader’s credentials as well as providing a quick bio on the man himself. Not that those credentials are anything to wave a stick at. Lionel Hampton wanted Tjader to join his band as a drummer, and at the time of this album’s release, Tjader was playing vibes in George Shearing’s heralded group. He was no joke. Only a paragraph is devoted to the music on the record, and it has only the cold, hard facts. As was standard protocol for Fantasy Records, the albums were pressed on translucent colored vinyl. But not orange. Not originally, anyhow. In 1953, it was pressed on blue and green vinyl, and probably some other hue, too. 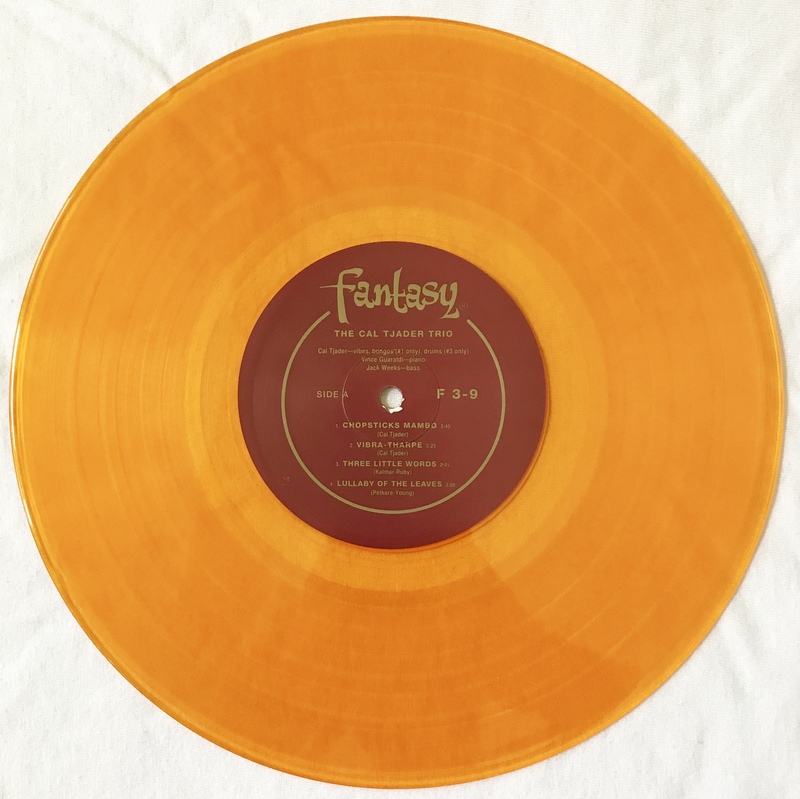 In 2013, as part of Record Store Day, Fantasy Records reissued the album in a limited edition pressing of only 2000 copies. Allegedly. I’ve seen Walmart selling a copy online, and there doesn’t seem to be a shortage of them, yet it sold out during Record Store Day back in 2013. In the words of Abraham Lincoln, muy interesante. Whatever the quantity and exclusiveness, it’s a beautiful record. The people at Fantasy (now Concord Music Group, or vice versa) either printed some amazingly retro throw-back labels or used original labels left over from 1953, as they look dang near the same as the vintage labels. The record is non deep-groove, pressed on a vibrant clear orange that matches the orange on the cover. It’s compact size makes it even more awesome. Originally, the sides with Vince Guaraldi were on the second side, with the more reserved piano of Mr. Marabuto on the first. For the 2013 release, the engineers opted to put Guaraldi’s session on the first side and and Marabuto’s on the other. Perhaps they, like me, found Guaraldi’s sides had more fire and thus made for a more arresting introduction to the record? I didn’t know about Record Store Day or even realize this was released until early 2015. Luckily, I was able to find an affordable copy on Amazon, and for under $15 it was mine. It was my first 10-inch album in my collection, and is definitely the most aesthetically pleasing out of all the other 10-inchers.